Marcozyme 250 Proteolytic Enzyme Supplements Side effects, Uses. We know enzymes as the digestive aids. They are the digestive aids but they also are much more than being the helping hand. They can directly involve in the immune activities and could also work on preventing certain diseases. Of all the important enzymes, proteolytic enzymes have a special place, as the body cannot survive without them. They help digest the proteins into its fragments and amino acids that are used for the various functions inside. The Marcozyme Proteolytic Enzyme supplement supplies the major 3 categories of the proteolytic enzymes- proteases, proteinases, and peptidases. 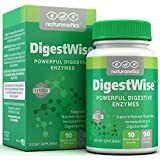 Taken from different sources, these enzymes improve the digestion and nutrient absorption and also take part in the defense mechanism of our bodies. 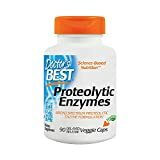 Proteolytic enzymes are a group of enzymes that digest protein and peptides. Though these enzymes are naturally present in our body, sometimes we would need more of these to have a healthier environment and for the immunity. In these cases, the proteolytic enzyme supplements such as Marcozyme are taken. 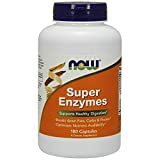 These supplements provide all the categories of these proteolytic enzymes and ensure complete breakdown of protein and also help in the reduction of inflammation, prevention of certain diseases, prevent cancer and also boost the overall immunity. 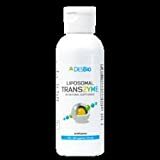 Liposomal Transzyme 4 Fl. Oz. Anti-inflammatory property: The major benefit of the Marcozyme Proteolytic Enzyme apart from proper digestion is its anti-inflammatory property. These enzymes can help reduce the inflammatory process of the body and control the allergy or the problem at hand. This property can help prevent the swellings and excess inflammation in any part of the body. Prevent inflammatory diseases: The same anti-inflammatory property can keep a check on the inflammatory diseases such as Ulcerative colitis and Crohn’s disease. It can reduce the severity of these diseases. Improve blood flow: The Marcozyme Proteolytic Enzyme contains the specific enzymes that are capable of preventing or reducing the swelling inside the blood vessel that could reduce the blood flow. In people who have this problem, these supplements could reduce the swelling and clear the path and automatically improve the blood flow. There would be less clotting and depositions in their veins. Joint pain: The inflammatory joint discomfort can be reduced with the help of the proteolytic enzymes. They can reduce the inflammation and thus pain as well. The same can also work on to speed up the recovery process sin athletes and help them recover from their injuries faster. Antioxidant: Certain enzymes like papain has got the antioxidant property that kill the free radicals that could cause damage. They can help prevent heart diseases, cancer, and other problems associated. Immunity: The proteolytic enzymes are can be natural killer cells that can eliminate toxins and pathogens from the body. They can also trigger the lymphatic drainage to strengthen the immune system. Marcozyme Proteolytic Enzyme supplement can be used in case of general enzyme deficiency, allergies, sinusitis, musculoskeletal problems, skin burns, some kind of abrasions etc. these enzymes can heal the wounds and speed up the recovery process. Pancreatin is a mixture of enzymes that can digest fats, proteins, and carbohydrates. These are usually used when the body is unable to produce the pancreatic enzymes due to health conditions or use of certain drugs. They are useful in boosting the immunity, improving digestion, support heart by eliminating the plaque in the blood vessels and generally help in the growth of the body by increasing the nutrient absorption. Papain is a powerful protease that can break down the toughest protein fiber into its fragments. It eliminates the toxins and also serves as an antioxidant. Papain can break the protein either in its end or anywhere in the middle as well. It can completely break the protein into peptides and then into the individual amino acids as well. 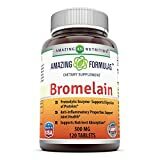 Bromelain is another proteolytic enzyme. But here, the specialty is that it can work in either acidic or alkaline environment equally. It has anti-inflammatory property, reduces allergies as in the case of sinusitis, reduces the discomfort after insect bites, recovers from sports injuries, relieves arthritis pain, and can balance the acidity in the stomach. Rutin is a bioflavonoid with an antioxidant property. It can help improve the blood circulation by increasing the flexibility of the blood vessels. It can also prevent the blood clots, cholesterol, pain associated with arthritis etc. 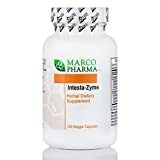 Trypsin is usually given to those who lack natural digestive enzymes. It works better when used I combination with bromelain and rutin. Trypsin is target specific enzyme where it cut only at specific points on the proteins. Chymotripsin is another protein digestive enzyme that also cut the proteins in specific sites that are not dealt by the enzyme trypsin. It can help the liver by reducing the damage, reduces inflammation and pain and prevent infections. Magnesium aspartate supplies magnesium that triggers the digestion process. 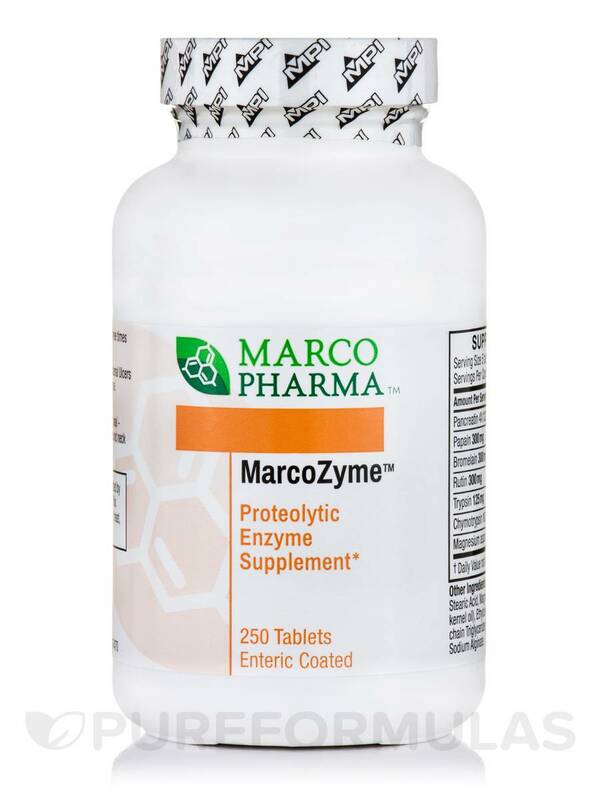 Marcozyme Proteolytic Enzyme is available in bottles that carry 250 tablets. The recommended dosage is 1-5 tablets taken thrice every day. The tablets should be taken between the meals, preferably after 2 hours of food. It would be recommended to start with a lower dose and see how the body responds to these tablets and then increase it gradually to avoid any side effects. In acute conditions, one may take 3-5 tablets every 1-2 hours for up to 3 days. Children can also take the Marcozyme Proteolytic Enzyme. They can take half the dose of the adults and also with the advice of a doctor. There are no serious side effects to Marcozyme Proteolytic Enzyme supplement. There could be a slight change in the appearance, color, and odor of the stool in some. Allergic reactions are not seen unless the person is allergic to any specific ingredient. There are no known drug interactions with these enzyme supplements. Enzymes are necessary for every activity inside the body but it should be taken only when the body lacks the enough quantity. Do your check up and make sure you need to take the supplements before taking the Marcozyme Proteolytic Enzyme.